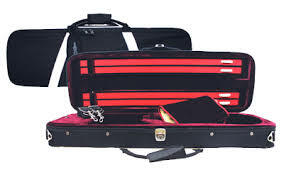 Primvera 4/4 lightweight violin case with black cover and plush burgundy lining. Large music pocket in lid. Four bow holders and blanket. Lock and ruck sack straps. Only 1.65Kg.